1Choose the Focus mode and AF-area mode. You adjust both settings via the control strip that appears when you press the i button. Remember that the camera doesn’t let you access all settings in certain exposure modes. 2Locate the focus frame in the Live View display. Wide Area and Normal Area: You see a red rectangular frame. Face Priority: If the camera locates faces, you see a yellow focus frame around each one. The brackets indicate the face that the camera will use to set focus—typically, the closest person. 3If you see a plain red frame, the camera can't detect a face and will set focus as it would if you were using Wide Area mode. 4Press the Multi Selector up, down, right, or left to position the focusing frame over your subject. In Face Priority mode, use the Multi Selector to move the box with the double yellow border—which indicates the final focusing point — from face to face in a group portrait. 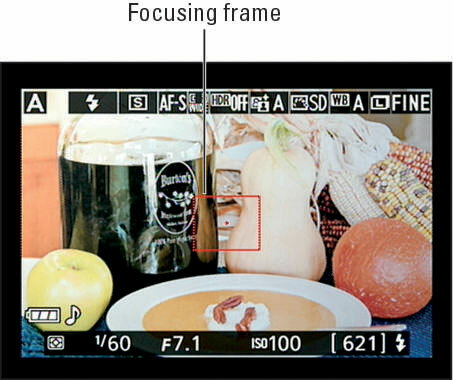 In Wide Area and Normal Area modes, press OK to quickly move the focus point to the center of the frame. 5In Subject Tracking AF-Area mode, press OK to initiate focus tracking. 6In AF-S Focus mode, press the shutter button halfway to start autofocusing. Wait for the focus frame to turn green. The appearance of the frame depends on the AF-Area mode. AF-S: You also hear a little beep (assuming that you didn’t disable the beep, which you can do via the Beep option, found in the Shooting/Display section of the Custom Setting menu). Focus is locked as long as you keep the shutter button pressed halfway. AF-F: Focus is adjusted if the subject moves. The focus frame turns back to red (or yellow or white) if focus is lost; when the frame turns green and stops blinking, focus has been achieved again. You can lock focus by pressing the shutter button halfway. In most cases, the camera resets focus on your subject when you press the button, even if the focus frame is already green. 7Press the Zoom In button to magnify the display to double-check focus. Each press gives you a closer look at the subject. 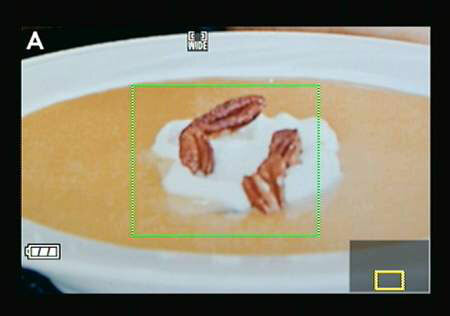 A small thumbnail appears in the lower-right corner of the screen, with the yellow highlight box indicating the area that’s being magnified. Press the Multi Selector to scroll the display if needed.